"Mezquita" redirects here. For other uses, see Mezquita (disambiguation). The Cathedral of Córdoba (Spanish: Catedral de Córdoba), also known as the Great Mosque of Córdoba (Spanish: Mezquita de Córdoba) and the Mezquita, whose ecclesiastical name is the Cathedral of Our Lady of the Assumption (Spanish: Catedral de Nuestra Señora de la Asunción), is the Catholic cathedral of the Diocese of Córdoba dedicated to the Assumption of the Virgin Mary and located in the Spanish region of Andalusia. The structure is regarded as one of the most accomplished monuments of Moorish architecture. Since the early 2000s, Spanish Muslims have lobbied the Roman Catholic Church to allow them to pray in the cathedral. This Muslim campaign has been rejected on multiple occasions, both by the church authorities in Spain and by the Vatican. It is commonly believed that the site of the Mosque-Cathedral was originally a Christian church dedicated to Saint Vincent the Third, which was divided and shared by Muslims and Christians after the Islamic conquest of the Visigothic kingdom. This sharing arrangement of the site lasted until 784, when the Christian half was purchased by the Emir Abd al-Rahman I, who then proceeded to demolish the original structure and build the grand mosque of Córdoba on its ground. This narrative, which goes back to the tenth-century historian al-Razi, echoed similar narratives of the Islamic conquest of Syria, in particular the story of building the Great Mosque of Damascus. For medieval Muslim historians, these parallels served to highlight a dynastic Umayyad conquest of Spain and appropriation of the Visigothic Córdoba. The historicity of this narrative has been challenged, as archaeological evidence is scant, nor is the narrative corroborated by contemporary accounts of the events following Abd al-Rahman I's initial arrival in al-Andalus. Another tenth-century source mentions a church that stood at the site of the mosque without giving further details. However, it is almost certain that the building which housed the original mosque was destroyed to build the first version of the Great Mosque. An archaeological exhibit in the Mosque–Cathedral of Cordoba displays fragments of a Visigothic building, emphasizing an originally Christian nature of the complex. According to Susana Calvo Capilla, a specialist on the history of the Mosque–Cathedral, although remains of multiple church-like buildings have been located on the territory of the Mosque-Cathedral complex, no clear archaeological evidence has been found of where either the church of St. Vincent or the first mosque were located on the site, and the latter may have been a newly constructed building. The evidence suggests that it may have been the grounds of an episcopal complex rather than a particular church which were initially divided between Muslims and Christians. According to a traditional account, when the exiled Umayyad prince Abd al-Rahman I escaped to Iberia and defeated the governor of Al-Andalus, Yusuf al-Fihri, he found the Cordovese divided into various sects, including the Gnostics, Priscillianists, Donatists, and Luciferians. His ambition was to erect a temple which would rival in magnificence those of Baghdad, Jerusalem, and Damascus, and approach in sanctity the fame of Mecca. Above a Christian church dedicated to Saint Vincent, Abd al-Rahman decided to raise his great mosque. He offered to buy the church and the plot. The negotiations for the sale were placed in the hands of the Sultan's favourite secretary, Umeya ibn Yezid. Under the terms of the transfer, the Cordovese were permitted to reconstruct the church formerly dedicated to Saints Faustus, Januarius, and Marcellus, three Christian martyrs whom they deeply revered. Abd al-Rahman allowed the Christians to rebuild their ruined churches and purchased the Christian half of the church of St Vincent, as agreed upon in the sale terms. The Emirate was rich. Apart from the treasure wrested from the Goths during the recent wars, he also extracted a tithe upon the produce of the land and on manufactures. All able Muslims in Andalusia were asked to pay the zakat. A mandatory tax known as jizya was also laid upon only one able Christian and Jew per household in Andalusia as a precondition for services & protection provided by the government of Andalusia, unless they participated in the protection services themselves. The Jizya was lesser than the Zakat, and both were one of the main sources of income for the Muslim rulers in lands occupied by Islamic tribes but populated still by Christians, to provide all needed services for all people living in the land, especially the poor. Beyond this, the Moorish kings were greatly enriched by the acquisition of the valuable mines of Iberia, the quarries of marble, and other sources of wealth. From these revenues Abd al-Rahman and his successors, Hisham, Abd-al Rahman II, the greatest of the dynasty and the third of the line, and lastly the extravagant Almanzor, lavished large sums upon the designing, construction, and costly adornment of the Mosque. Abd al-Rahman I and his descendants reworked the building over the next two centuries to fashion it as a mosque, starting in 784. Additionally, Abd al-Rahman I used the mosque (originally called Aljama Mosque) as an adjunct to his palace and named it in honour of his wife. Traditionally, the mihrab (or apse) of a mosque faces in the direction of Mecca; by facing the mihrab, worshipers pray towards Mecca. Mecca is east-southeast of the mosque, but the mihrab of this mosque unusually points south. The work of building the resplendent Mezquita employed thousands of artisans and labourers, and such a vast undertaking led to the development of all the resources of the district. Hard stone and beautifully veined marble were quarried from the Sierra Morena and the surrounding regions of the city. Metals of various kinds were dug up from the soil, and factories sprang up in Córdoba amid the stir and bustle of an awakened industrial energy. A famous Syrian architect made the plans for the Mosque. Leaving his own house on the edge of Córdoba, the Emir came to reside in the city, so that he might personally superintend the operations and offer proposals for the improvement of the designs. Abd al-Rahman moved about among the workers, directing them for several hours of every day. The mosque underwent numerous subsequent changes: Abd al-Rahman II ordered a new minaret, while in 961 Al-Hakam II enlarged the building and enriched the Mihrab. The last of such reforms was carried out by Almanzor in 987. It was connected to the Caliph's palace by a raised walkway, mosques within the palaces being the tradition for previous Islamic rulers – as well as Christian Kings who built their palaces adjacent to churches. The Mezquita reached its current dimensions in 987 with the completion of the outer naves and courtyard. In planning the mosque, the architects incorporated a number of Roman columns with choice capitals. Some of the columns were already in the Gothic structure; others were sent from various regions of Iberia as presents from the governors of provinces. Ivory, jasper, porphyry, gold, silver, copper, and brass were used in the decorations. Marvellous mosaics and azulejos were designed. Panels of scented woods were fastened with nails of pure gold, and the red marble columns were said to be the work of God. The primitive part of the building, erected under the direction of Abd al-Rahman I., was that which borders the Court of Oranges. Later, the immense temple embodied all the styles of Morisco architecture into one composition. The Great Mosque of Córdoba held a place of importance amongst the Islamic community of al-Andalus for three centuries. In Córdoba, the capital, the Mosque was seen as the heart and central focus of the city. Muhammad Iqbal described its hypostyle hall as having "countless pillars like rows of palm trees in the oases of Syria". To the people of al-Andalus "the beauty of the mosque was so dazzling that it defied any description." The main hall of the mosque was used for a variety of purposes. It served as a central Prayer hall for personal devotion, the five daily Muslim prayers and the special Friday prayers. It also would have served as a hall for teaching and for Sharia law cases during the rule of Abd al-Rahman and his successors. The Great Mosque of Córdoba exhibited features and an architectural appearance similar to the Great Mosque of Damascus, which may have been used as a model. The building is most notable for its arcaded hypostyle hall, with 856 columns of jasper, onyx, marble, granite and porphyry. These were made from pieces of the Roman temple that had occupied the site previously, as well as other Roman buildings, such as the Mérida amphitheatre. The double arches were an innovation, permitting higher ceilings than would otherwise be possible with relatively low columns. The double arches consist of a lower horseshoe arch and an upper semi-circular arch. The famous alternating red and white voussoirs of the arches were inspired by those in the Dome of the Rock and also resemble those of the Aachen Cathedral, which were built almost at the same time. Horseshoe arches were known in the Iberian Peninsula since late Antiquity, as can be seen on the 3rd-century "Estela de los Flavios", now in the archaeological museum of León. A centrally located honeycombed dome has blue tiles decorated with stars. The edifice also has a richly gilded prayer niche or mihrab. The mihrab is a masterpiece of architectural art, with geometric and flowing designs of plants. Other prominent features were an open court (sahn) surrounded by arcades, screens of wood, minarets, colourful mosaics, and windows of coloured glass. The walls of the mosque had Quranic inscriptions written on them. As many adherents of Islam reject sculptural or pictorial representations of people or of God within religious contexts, all decoration of the cathedral is accomplished through tile work, calligraphy and architectural forms. Arrazi, an Arab writer, speaks of the valuable wine-coloured marble, obtained from the mountains of the district, which was much used in embellishing the naves of the mosque. Photo circa 1870 depicting interior of mosque-cathedral, taken by Manuel Castillo de la Ruiz. The building's floor plan is seen to be parallel to some of the earliest mosques built from the very beginning of Islam. It had a rectangular prayer hall with aisles arranged perpendicular to the qibla, the direction towards which Muslims pray. The prayer hall was large and flat, with timber ceilings held up by arches of horseshoe-like appearance. Hisham's mosque covered an area of 460 by 280 feet (140 m × 85 m). It was flanked by stout, fortified walls, with watch towers and a tall minaret. There were nine outer gates and eleven inner doors. Each door led to an aisle within the mosque. The court had spacious gates on the north, west, and east sides, and fountains for the purification of the pious. The eleven north-to-south aisles were crossed by twenty-one narrower ones running from east to west. One hundred and fifty years after the mosque's creation, a staircase to the roof was added, along with a southward extension of the mosque itself. A bridge was built linking the prayer hall with the Caliph's palace. The mosque was later expanded even further south, as was the courtyard which surrounded it. The mosque was built in four stages, with each Caliph and his elite contributing to it. Until the 11th century, the courtyard was unpaved earth with citrus and palm trees irrigated – at first by rainwater cisterns, and later by aqueduct. Excavation indicates the trees were planted in a pattern, with surface irrigation channels. The stone channels visible today are not original. Abd al-Rahman III added a new tower. The minaret contained two staircases, which were built for the separate ascent and descent of the tower. On the summit there were three apples, two of gold and one of silver, with lilies of six petals. The minaret is four-faced, with fourteen windows, having arches upon jasper columns, and the structure is adorned with tracery. In 1236, Córdoba was conquered by King Ferdinand III of Castile, and the centre of the mosque was converted into a Catholic cathedral. Alfonso X oversaw the construction of the Villaviciosa Chapel and the Royal Chapel within the mosque. The kings who followed added further Christian features, such as King Henry II rebuilding the chapel in the 14th century. The minaret of the mosque was also converted to the bell tower of the cathedral. It was adorned with Santiago de Compostela's captured cathedral bells. Following a windstorm in 1589, the former minaret was further reinforced by encasing it within a new structure . The most significant alteration was the building of a Renaissance cathedral nave in the middle of the expansive structure. The insertion was constructed by permission of Charles V, king of Castile and Aragon. However, when Charles V visited the completed cathedral he was displeased by the result and famously commented: "You have destroyed something unique to build something commonplace." Roof of the Mezquita-Catedral. Skylights built in the Almanzor expansion can be seen along with the buttress of the Christian church built in the 16th century. Muslims across Spain have lobbied the Roman Catholic Church to allow them to pray in the complex, with the Islamic Council of Spain lodging a formal request with the Vatican. However, Spanish church authorities and the Vatican have opposed this move. These battles over the cathedral reflect the contested view of what constitutes Spanish history and Spanish identity. Battles over holy sites claimed by different faiths are also evident in Jerusalem, Israel; Istanbul, Turkey; elsewhere in pre-Reformation/post-Reformation Europe, and most recently in Ukraine, 2018, over "the division of valuable church property" there. Recently the diocese of Cordoba said in a statement: "We call on politicians and institutions to show responsibility and not to feed this false controversy which merely fuels division." According to cathedral authorities, when half a dozen Austrian Muslims, who were part of a group of 118 people on an organized tour for young European Muslims, knelt to pray at the same time, security guards stepped in and "invited them to continue with their tour or leave the building". A fight took place between two of the tourists and the security guards. The security guards suffered serious injuries and had to be hospitalised and two Muslim men were detained. Louis L'Amour's The Walking Drum features a detailed description of the Court of Oranges in the 12th century. ^ "Web Oficial del Conjunto Monumental Mezquita-Catedral de Córdoba". Retrieved 15 August 2016. ^ a b c "Mosque-Cathedral of Córdoba". Encyclopædia Britannica, Inc. Retrieved 15 August 2016. ^ Lapunzina, Alejandro (2005). Architecture of Spain. Greenwood Publishing Group. p. 81. ISBN 9780313319631. ^ DK Eyewitness Travel Guide: Seville & Andalusia. Penguin. 2006. p. 148. ISBN 9781465453211. ^ Geoff Garvey, Mark Ellingham (2009). The Rough Guide to Andalucia. Penguin. p. 474. ISBN 9781405383714. ^ Isabella Noble; John Noble; Josephine Quintero; Brendan Sainsbury (2016). Lonely Planet Andalucia. Lonely Planet. p. 22. ISBN 9781760340063. ^ 100 Countries, 5,000 Ideas. National Geographic Society. 2011. p. 299. ISBN 9781426207587. The eight-century Great Mosque with double arches in Córdoba was transformed into the Cathedral of our Lady of Assumption. ^ Daniel, Ben (2013). The Search for Truth about Islam. Westminster John Knox Press. p. 93. ISBN 9780664237059. The church is Catholic and has been for centuries, but when Catholic Spaniards expelled the local Arabic and Muslim population (the people they called the Moors) in 1236, they didn't do what the Catholic Church tended to do everywhere else when it moved in and displaced locally held religious beliefs: they didn't destroy the local religious shrine and build a cathedral of the foundations of the sacred space that had been knocked down. Instead, they built a church inside and up through the roof of the mosque, and then dedicated the entire space to Our Lady of the Assumption and made it the cathedral for the Diocese of Córdoba. ^ www.mezquitadecordoba.org, Alhambra Valparaiso Ocio y Cultura S.L. -. "History of the Mosque Cathedral of Cordoba". mezquitadecordoba.org. ^ a b c d e Nuha N. N. Khoury (1996). "The Meaning of the Great Mosque of Cordoba in the Tenth Century". Muqarnas. 13: 80–98. doi:10.2307/1523253. JSTOR 1523253. A myth that associates the mosque's site with the church of Saint Vincent acts as an intermediary step in the transformation of the mosque into a monument of dynastic conquest [...] On the authority of the tenth-century al-Razi, later medieval historians assert that the original founders of the Cordoba mosque shared the church of Saint Vincent with the city's Christian population [...] The account posits a parallel with two earlier Islamic paradigms [...] However, the church of Saint Vincent is neither archaelogically attested as the major edifice mentioned by the historians [...] nor specifically by name in accounts of the events following Abd al-Rahman I's initial arrival in al-Andalus. Rather, the anonymous tenth-century Akhbar Majmu'a on the history of al-Andalus mentions a church, "the site of the present-day Friday mosque"
^ a b c Guia, Aitana (1 July 2014). The Muslim Struggle for Civil Rights in Spain, 1985–2010: Promoting Democracy Through Islamic Engagement. Sussex Academic Press. p. 137. ISBN 9781845195816. It was originally a small temple of Christian Visigoth origin. 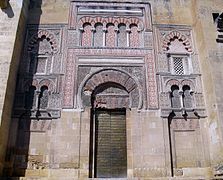 Under Umayyad reign in Spain (711–1031 CE), it was expanded and made into a mosque, which it would remain for eight centuries. During the Christian reconquest of Al-Andalus, Christians captured the mosque and consecrated it as a Catholic church. ^ a b Armstrong, Ian (2013). Spain and Portugal. Avalon Travel Publishing. ISBN 9781612370316. On this site originally stood the Visigoths' Christian Church of San Vicente, but when the Moors came to town in 758 CE they knocked it down and constructed a mosque in its place. When Córdoba fell once again to the Christians, King Ferdinand II and his successors set about Christianizing the structure, most dramatically adding the bright pearly white Renaissance nave where mass is held every morning. ^ a b c Sills, Ben (19 April 2004). "Cathedral may see return of Muslims". The Guardian. London. ^ a b Fuchs, Dale (28 December 2006). "Pope asked to let Muslims pray in cathedral". The Guardian. London. ^ a b c Ann Christys (2017). "The meaning of topography in Umayyad Cordoba". In Anne E. Lester. Cities, Texts and Social Networks, 400–1500. Routledge. It is a commonplace of the history of Córdoba that in their early years in the city, the Muslims shared with the Christians the church of S. Vicente, until ʿAbd al-Raḥmān I bought the Christians out and used the site to build the Great Mosque. It was a pivotal moment in the history of Córdoba, which later historians may have emphasised by drawing a parallel between Córdoba and another Umayyad capital, Damascus. The first reference to the Muslims’ sharing the church was by Ibn Idhārī in the fourteenth century, citing the tenth-century historian al-Rāzī. It could be a version of a similar story referring to the Great Mosque in Damascus, which may itself have been written long after the Mosque was built. It is a story that meant something in the tenth-century context, a clear statement of the Muslim appropriation of Visigothic Córdoba. ^ Jarbel, Rodriguez. Muslim and Christian Contact in the Middle Ages: A Reader. University of Toronto Press. p. 41. ISBN 9781442600669. ^ D. Fairchild Ruggles (2010). "The Stratigraphy of Forgetting". In Helaine Silverman. Contested Cultural Heritage: Religion, Nationalism, Erasure, and Exclusion in a Global World. Springer. p. 63. An archaeological display in the Mosque-Cathedral of Cordoba displays fragments of a Visigothic building, emphasizing an originally Christian nature of the site. ^ a b Eric Calderwood (10 April 2015). "The Reconquista of the Mosque of Córdoba". Foreign Policy. Retrieved 29 December 2015. ^ Susana Calvo Capilla (2007). 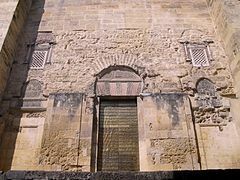 "Las primeras mezquitas de al-Andalus a través de las fuentes árabes". Al-Qantara. 28 (1): 169–170. doi:10.3989/alqantara.2007.v28.i1.34. ^ a b c d e f Calvert, Albert Frederick; Gallichan, Walter Matthew (1907). Cordova, a City of the Moors (Public domain ed.). J. Lane. pp. 42–. ^ Josef W. Meri and Jere L. Bacharach, Medieval Islamic Civilization, Routledge, (2005), p. 176 ff. ^ Blockmans, Wim, and Peter Hoppenbrouwers. Introduction to Medieval Europe 300–1500. Routledge, 2014. ^ Lapunzina, Alejandro (2005). Architecture of Spain. Greenwood Publishing Group. pp. 82–83. ^ a b c Jayyusi, Salma Khadra, ed. The Legacy of Muslim Spain, 2 Vols.. Leiden: BRILL, p.599. ^ a b c Anwar, G. Chejne, Muslim Spain: Its History and Culture, MINNE ed. Minnesota: University Of Minnesota Press, p.364. ^ Jan, Read. The Moors in Spain and Portugal. London: Rowman & Littlefield Pub Inc, p.56. ^ a b The Literature of Al-Andalus (The Cambridge History of Arabic Literature). New Ed ed. New York: Cambridge University Press, 161. ^ Ruggles, D. Fairchild (2008). Islamic Gardens and Landscapes. University of Pennsylvania Press. p. 152. ISBN 978-0-8122-4025-2. ^ "Interior of a Mosque at Cordova". The Walters Art Museum. ^ Apple, Raymond Walter (1986). 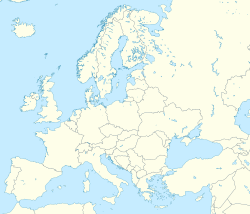 Apple's Europe, an uncommon guide. Atheneum. p. 186. ^ D. Fairchild Ruggles, "The Stratigraphy of Forgetting: The Great Cathedral of Cordoba and Its Contested Legacy," in Contested Cultural Heritage, ed. Helaine Silverman. New York: Springer, 2011, pp. 51–67. Spanish translation in the journal Antípoda:Revista de Antropología y Arqueología (Bogotá, Colombia) 12 (2011): 19–38. ^ Neil MacFarquhar, "Ukraine Church Moves to Break With Moscow," NEW YORK TIMES, Dec. 16, 2018, 10. ^ James Marson, "New Ukraine Church Is Rebuff to Russia," THE WALL STREET JOURNAL, 12/17/18, A 11. The article warns of "bloodshed" if the Ukraine government tries to "take control of religious buildings" that another group is using. The worse tensions regarding use of religious sites is in Jerusalem, especially in regard to the Dome of the Rock. ^ James Roberts, "Church in the World, THE TABLET, 29 September 2018, 23. ^ a b c Tremlett, Giles (1 April 2010). "Two arrested after fight in Cordoba's former mosque". The Guardian. London. ^ a b c Keeley, Graham (3 April 2010). "Muslims arrested for trying to pray in Cordobas former Mosque". The Times. London. ^ "Muslims in Spain campaign to worship alongside Christians". CNN. 7 September 2010. ^ "Iqbal and Spain – Home Page". allamaiqbal.com. Jover Báez, J.; Rosa, B. (2017). 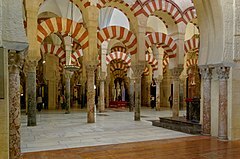 "Patrimonio cultural en disputa: la Mezquita-Catedral de Córdoba". Cuadernos Geográficos. 56 (1). pp. 322–343. Messina, Barbara (2004). Geometrie in pietra. La moschea di Cordova. Naples: Giannini. ISBN 9788874312368. Wikimedia Commons has media related to Mezquita de Córdoba.